About one thousand people gathered on 19 January, 2008 in Pilsen, Czech Republic, to commemorate the victims of nazi terror: 66 years ago, Jews from Pilsen were deported to concentration camps, but nobody knew that another victim of current neo-nazi violence is at the very same time fighting for his life in a hospital. On 18 January in Pribram, a town 50 km south-west of Prague, 20-year-old neo-nazi Jiri Fous stabbed 18-year-old Jan Kucera in the groin and back about an hour to midnight. Before this attack, young local neo-nazis were provoking with nazi salutes and offending a group of young punks and antifascist skinheads, to which Jan belonged. Jan’s friends were trying to stop the bleeding from his femoral artery and called for an ambulance. Neither the paramedics nor Jan’s friends realized that Jan had also been stabbed in the back before it was too late. Jan lost massive amounts of blood and fell unconscious. He was rushed to a nearby hospital, but even though he was in the hands of professional doctors, he died on Sunday morning. Jan Kucera was an antifascist skinhead from Pribram, and he was never afraid to express his opinions. In his Internet profile, he wrote: "I’m a normal boy and I consider myself a SHARP skinhead. I don’t care who my friends are - I don’t judge people because of their musical taste, their clothes or the colour of their skin. I judge people by what they do. Anybody can write to me. I hate nazis, the bourgeoisie, communists and similar scum! Antifascista Oi!" He stood by his opinions until the very end. 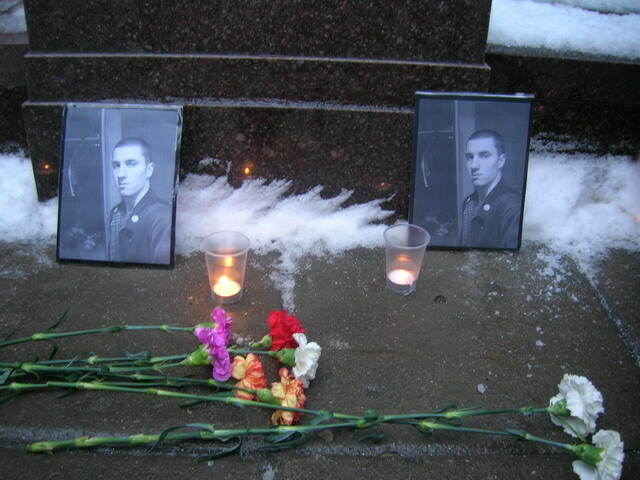 He will stay forever in the hearts of his family, friends, and all people with an antifascist attitude. Honour to his memory. we got this web address for a blog by the January 21st Committee, the group spearheading the "official" call for action against Richard Barrett's, Nationalist Movement. demos is recent times. The obvious reason is the most recent events in Jena. While Barrett's group is a fairly irrelevant organization, we should be asking if the Right and the fascists are looking to capitalize on the social crisis here and abroad, along with tension over the many unresolved issues of race and class in the U.S.
From immigration to competition over fewer and fewer jobs and resources, to the fact that there continues to exist class divisions (and within the working classes)that are racist and segregationist. Some of the fascist groups are looking to capitalize on these. The Anti-Uptown Working Group and others in the Kansas City and Lawrence communities ask you to take a stand against racist terror! The Minutemen Civil Defense Corps, an anti-immigrant armed vigilante group that patrols the U.S./Mexico border, is having their regional leadership conference in Kansas City on Feb 1st and 2nd. Keep the pressure on: Some calls to action against the Minutemen! communities ask you to take a stand against racist terror! Anti-Racists and immigrant rights supporters from Kansas City and the surrounding areas are organizing to stop this meeting from happening! THREE THINGS YOU CAN DO TO HELP SHUT DOWN THE MINUTEMEN! 1) Keep the pressure on venues that are supporting the Minutemen Conference. The bottom line is that our pressure on the Uptown has created a climate where no major venue in KC will ever work with the Minutemen again after this conference is over. However, the hotels they are staying in (and there is much reason to believe that one of these hotels is hosting their meeting for the second day of their conference) need to have a clear message sent to them. -The Minutemen Civil Defense Corps is an anti-immigrant vigilante organization with ties to international white supremacist organizations. -The Minutemen are coming to Kansas City to further recruit and strengthen their white supremacist agenda. -We're concerned with your hotel's active support for a white supremacist organization by renting their organization rooms. -We would ask you to take a stand against racial terror in the KC community by canceling any and all contracts that you may have the Minutemen or any attendees of their conference. -If this is impossible, we would ask your hotel to make a public statement denouncing the Minutemen and their tactics and post this at your hotel in a public space. Of course, in the instances that the Minutemen have rented the rooms as individuals, this won't be as affective, but we need to demand public statements from these businesses. 2) On Friday, Feb 1st, people will meet at 4PM at Cristo Rey School (211 W. Linwood BLVD) in Kansas City and then march to the Uptown Theater (3700 Broadway St), the location of the first day of the Minutemen meeting. We are calling for you to come and join the people of Kansas City in response to the Minutemen's racist action in our community. 3) The following day, Saturday, Feb 2nd, the Minutemen will be holding their membership-only meeting to discuss and determine their plans for 2008. This meeting will be crucial to the ability of the Minutemen to continue to function as an organization. In response, Kansas Mutual Aid is calling on fellow anti-racists to converge on the location (TBA as these details become available, but keep this date open if you want to participate in actions to shut them down) of the meeting and help us "build a wall against racism". We will shut this meeting down! More details will be announced as they become available. There is room for a variety of tactics, and we are calling on anyone wishing to confront racism to join us. We encourage people to form affinity groups and take autonomous action. It appears that the fascist organization, The Nationalist Movement, plans to to march in Jena January 21. The NM is led by long time fascist, Richard Barrett. A Lawyer and original member of the organization that would go on to become the National Alliance, Barrett is seen as a provocateur and general incompetent by rival fascists. Still, Barrett has staged many previous demonstration, some that have ended in riots. Given the situation in Jena, this event could unfold into a major event with parties coming from all the sides - racist, anti-racist, State agents, and radicals. It also appears that the call for action against the fascists is being spearheaded by the Revolutionary communist Party (RCP). threewayfight does not endorse the RCP, and there are political positions regarding the nature of the antifascist struggle, White supremacist politics, and the relationship between the fascists and the State that can be debated. however, the announcement below is posted more to inform antifascists of news. we should encourage antifas to organize and participate in protests against the NM. This Call already has a number of prominent and significant signatories including Black and white residents of Jena, some parents of the Jena 6, 60 people from the Cabrini Green housing project in Chicago, Cornel West, Herb Boyd, Cindy Sheehan, and Medea Benjamin. Endorsers are still being gathered. And this is shaping up to be very significant. We encourage people to spread this Call far and wide, sign it, and get others to sign it. The Call puts out an important challenge to people of all nationalities to organize to be in Jena on January 21 to DROWN OUT these KKKluckers, whose message is about actually carrying out terror and murder against Black people. What Time Is It in America? Nooses hung on a “whites-only” tree at Jena High School put a huge spotlight on the unequal oppressive social relations and institutions that exist today and are brutally enforced. This struck a nerve among Black people all over the country. AND it also struck a nerve among despicable and hateful proponents of white supremacy who are striking back in response to the powerful demonstration in Jena on September 20 in support of the Jena 6. There is a real battle going on in this country over NOOSES and all that they represent. A real struggle over what kind of world we want. After the September 20 rally in Jena, in just the next two months, there were as many as 50 to 60 noose incidents around the country. There were more than 22 noose incidents in October 2007 alone, including: October 4, a noose is hung on a construction site in O’Hara Township, PA; October 5, nooses are found hanging from a tree in front of a local high school in Columbia, SC; October 9, a Columbia University professor, a Black woman who teaches about racial justice, finds a noose hanging from her office door; October 22, in Brooklyn, NY, a noose is sent to the Black principal at Carnarsie High School; and October 24, in Shreveport, LA, a noose is found in a doctors’ break room at the LSU Health Science Center. But the forceful imposition of white supremacy and this explosion of ugly, racist threats against Black people is not simply or even fundamentally a case of “good ole boys” going wild. All this is happening at a time when the U.S. Supreme Court, the highest judicial body in the land, has overturned Brown vs. Board of Education—officially fortifying segregation and savage inequalities in the schools. This is happening only a couple of hundred miles from New Orleans, where the U.S. government carried out the most horrendous crimes against hundreds of thousands of Black people, abandoning them in the floodwaters of Katrina, treating them like animals, heartlessly evacuating them and then making it all but impossible for them to return and rebuild their homes and lives. White supremacy, lynchings and KKK terror were shaped, encouraged by and served to keep in effect a whole system that could not have existed without first slavery, and then near slavery, and segregation and terror centered in the South. The economic system of SLAVERY was an integral and foundational part of the whole way capitalism developed and grew in the United States. The end of slavery did not end the systemic oppression and super-exploitation of Black people. Millions of Black people were subjected to new forms of exploitation as sharecroppers. And a whole “Southern culture” came out of this—of KKK cross burnings, lynchings, and Jim Crow laws that required “white only” and “Black only” public schools, drinking fountains, trains, buses, and all kinds of other public places. These unequal and oppressive relations have been and continue to be brutally enforced. And while Black people no longer mainly face widespread lynching and cross burnings—though the kluckers planning on marching in Jena would like to bring them back—Black people do face the widespread terror of police brutality and murder. The U.S. system of capitalism has profited off the exploitation and oppression of Black people from Day One. And white supremacy has been and is built into the very foundations of this system—in the economic relations, social relations, and all the thinking and culture that come from and in turn reinforce these relations of inequality. This is why nothing short of getting rid of this system, of making revolution and building a whole new socialist system based on emancipating all humanity, can lead to actually getting rid of the oppression of Black people and other minority nationalities in this country. The kluckers’ plan to march in Jena is happening in a whole climate and atmosphere in this country where white supremacy is being given a green light and is running amok. Look at what has happened just since September 20, when tens of thousands came to Jena to say: ENOUGH IS ENOUGH! November 14, 2007: In Pasadena, Texas, a white racist named Joe Horn saw two Latino men, who he thought were Black, breaking into his neighbor’s house. Horn called 911 to say he was going to shoot them dead. And then he did—giving them a vigilante death sentence for suspicion of burglary. When a group of about ten Black people marched in the street protesting the killing, hundreds of supporters of Joe Horn surrounded them, carrying American flags, hurling racist slurs, and shouting over and over, “USA!, USA!” Horn faces no charges. January 4, 2008: While broadcasting a PGA tour event, Kelly Tilghman, the Golf Channel’s main play-by-play anchor, was talking about Tiger Woods’ dominance on the Professional Golf Tour and laughed as she said that his competitors should “lynch Tiger Woods in a back alley.” As usual, Tilghman issued a formal apology, asking forgiveness from viewers who “may have been offended by my comments”—as if she herself wasn’t offended or didn’t even have a clue as to why such a remark is so racist! The whole history of nooses, of lynching, runs long and deep in this country. And it is not just a thing of the past. In 1981, Michael Donald was randomly picked out by members of the Alabama Ku Klux Klan who were angry that a Black man on trial had not been found guilty of killing a policeman. They beat him with a tree limb before cutting his throat and hanging him from a tree. And remember what happened to James Byrd? A Black man in Jasper, Texas. A rope tied around his neck, dragged behind a truck by white racists until his head separated from his body. What year was that? Not 1870 or 1920 or even 1950. It was 1998. According to the Tuskegee Institute, 3,437 African-Americans were lynched between 1880 and 1951. This means that for many Black people in this country the NOOSE and LYNCHING are not-so-long-ago family history. The “whites-only” tree where nooses were hung in Jena symbolized a whole “way of life” in that town—of blatant segregation, discrimination, and inequality for Black people. It echoed decades of American history when KKK night-riders lynched Black people and town sheriffs put white sheets on after sundown. Of “southern just-us” where any white person could get away with the murder of someone Black. Where 14-year-old Emmett Till was murdered for whistling at a white woman by a gang of racist whites who were quickly acquitted by an all-white jury. These nooses reflected today’s reality of Black youth shot down by the police or locked away in prison for the rest of their lives. Of 21st-century USA “just-us” where an all white jury can sentence Mychal Bell (one of the Jena 6) to years in prison for standing up against white supremacy—and the U.S. Justice Department then calling this all “regular, not irregular.” Where residents of Jena can recall how a Black man, not that long ago, was stomped to death by a gang of white guys because he bumped into a white woman. THIS STATUS QUO of white supremacy is what the kluckers want to defend and enforce with their march in Jena. The white supremacists must be politically confronted and opposed and put on the defensive. One resident of Jena said: “If they [the white racists] do this and nobody says anything, they’re going to feel like they can do anything they want.” But the message that emerges on that day must be very different: That it is long past time for this to be tolerated. There must be a powerful political response and a heightened understanding throughout society of the kind of unity we need, of people of all nationalities standing up against white supremacy in any form, wherever it rears its head. We should remember that it was a very GOOD thing that the hanging of nooses in Jena was NOT ignored, that people didn’t just dismiss it, hoping it would just go away. NO! People all over the country and the world heard about it and in response people felt it had to be widely, boldly, and massively exposed and opposed. People felt compelled to find the ways to make it known that: ENOUGH IS ENOUGH! It was shameful that hardly any white people—from Jena or anywhere else—were at the “Free the Jena 6” protest on September 20. And now it is especially important that white people be out there among those who respond to the call to protest white supremacy on January 21. Those white people in Jena who say they’re not racists, who are perhaps sorry they didn’t come out on September 20, now have a second chance! The kluckers are declaring that white people in Jena will be marching with them. And the system will come down on anyone, Black or white, who goes up against the racist status quo. As one young white woman in Jena said, “If you’re white and you go to visit your Black friends in their neighborhood, you’re gonna get stopped, because you ‘don’t belong there.’” People who step out to join the struggle against white supremacy, Black or white, should be supported and if they face official or unofficial threats, people should have their backs. There is no “being neutral” when white supremacists plan on marching on MLK Day with NOOSES! The question is what message will emerge on January 21 from Jena. That Kluckers with nooses marched unopposed? Or that there was a powerful political response that DROWNED OUT their hateful message? The masses of people of all nationalities have a common interest in opposing white supremacy. But it will take real struggle to forge this unity. And it is important to bring about real concrete and visible manifestations of people’s determination to NOT TOLERATE white supremacy in any form. Solidarity & Defense is an anti-racist,anti-fascist group. We actively confront neo-Nazis like the NSM. We support grassroots action against Nazis. The below article is informational and is an alert to anti-racist organnizers in Michigan. The NSM has supporters in Warren, Cadillac, and Grand Rapids. Two years ago the NSM held a rally in Toledo, OH where residents angrily resisted the Nazis and the cops protecting them. The NSM were forced to flee the area. Since then the NSM has also held rallies in Lansing and Grand Rapids. The Lansing rally saw several NSM Nazis beaten and forced to leave. The NSM advocates extreme violence against "non-White" people, and believes in pogroms and forced repatriation of people out of "White" territory. For more on S&D's position on anti-Nazi organizing see documents in side bars under, Fighting Words.